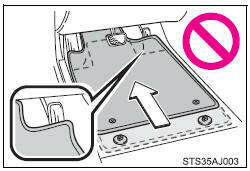 Failure to do so may cause the driver's floor mat to slip, possibly interfering with the pedals while driving. An unexpectedly high speed may result or it may become difficult to stop the vehicle, leading to an accident, or leading to death or a serious injury. Do not use floor mats designed for other models or different model year vehicles, even if they are toyota genuine floor mats. Only use floor mats designed for the driver's seat. 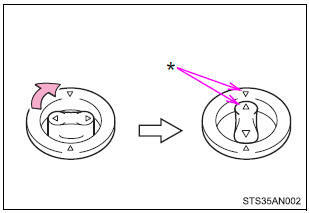 Always install the floor mat securely using the retaining hooks (clips) provided. Do not use two or more floor mats on top of each other. Do not place the floor mat bottom-side up or upside-down. Check that the floor mat is securely fixed in the correct place with all the provided retaining hooks (clips). Be especially careful to perform this check after cleaning the floor. 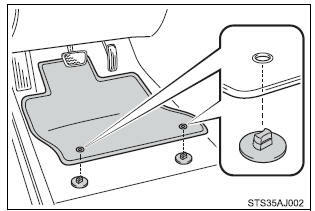 With the engine stopped and the shift lever in p, fully depress each pedal to the floor to make sure it does not interfere with the floor mat.